Totally flirting with Amazon a day ahead of their expected PDA with the launch of the Kindle Fire tablet, Hearst has also dropped some stats about digital sales of its magazines. 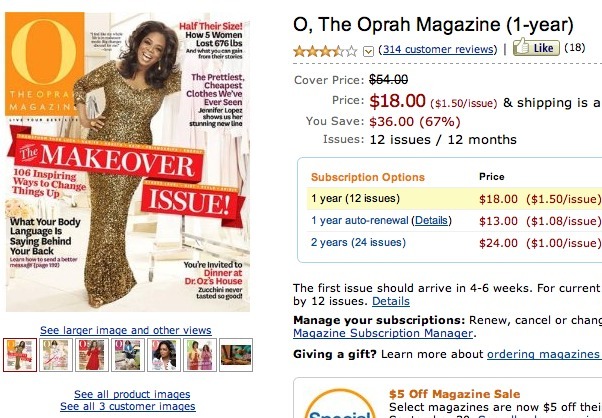 The publisher behind Oprah’s O Magazine, Marie Claire, Good Housekeeping, Redbook, Food Network Magazine and Car and Driver is pleased by the volume they’ve been doing for digital sales. While, as AllThingsD points out, it’s difficult to quantify sales of digital copies for a number of factors (such as fewer comparative stats or differentiation between single copies and digital subscriptions, or the number that are print freebies) Hearst is positive on digital sales growth. And in Hearst’s case, the publisher is stressing that all 300,000 of its [monthly] downloads were tied to a payment. Because unlike its peers, it doesn’t offer print/digital bundles.